Employing a full-time team of specialists to analyse and address the variety of complex issues typically faced in the Oil and Gas, Power Generation and Nuclear industries is a sizeable undertaking. This requirement is often not achievable in most business units due to financial pressures and lack of available competent personnel in the market. AIE provides independent technical, consultancy and auditing services to support our clients’ day-to-day operations, including provision of subject matter experts in a variety of disciplines. We have a wide range of highly experienced operations personnel who are fully conversive with the latest technology, codes and standards within the Oil and Gas, Power Generation and Nuclear industries. We integrate our services with our clients’ operations and are responsive in our service delivery, covering all operational requirements including technical authority provision, subject matter experts, integrity assessment, auditing, tender preparation and bid evaluation. In addition, AIE provides HSE and compliance assessment services to meet corporate or regulatory requirements. AIE provides education and training to heavy industry on the minimum integrity standards to ensure that major accident hazards are prevented. Our independence and in-depth knowledge allows AIE to deliver a comprehensive and objective evaluation of integrity performance which is benchmarked against similar assets in a variety of locations throughout the MENA region such as Algeria, Egypt, Kurdistan, Oman, Qatar, Saudi Arabia and UAE. Our external integrity audit and asset assessment service is performed either in accordance with an ongoing predetermined integrity plan to regularly measure integrity performance, or as a one-off exercise. This audit assessment service is particularly useful for defining integrity gaps in order to support legal claims and expert witness support, or as part of a due diligence exercise. 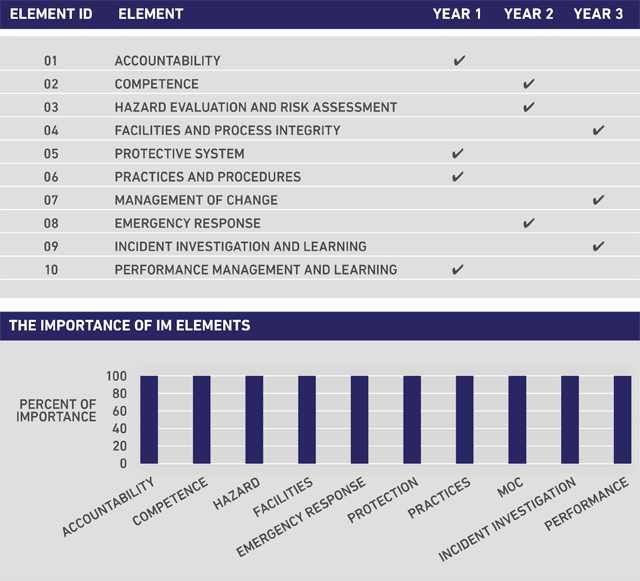 An overview of our integrity audit and assessment system for Oil and Gas operations is shown below.